Their chef demo that follows will kick off a full day of great events on the Chefs at Play stage, including demos by Rick Bayless of the Frontera restaurant group (our 2014 Good Food Chef of the Year) and Rob Levitt of The Butcher & Larder at Local Foods. For the first time, admission to the family-friendly Good Food Festival at Chicago’s UIC Forum is free. 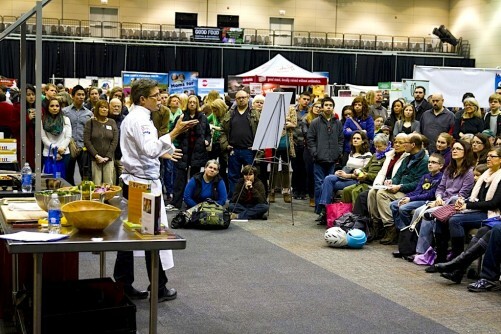 To register in advance, and to learn more about FamilyFarmed’s three-day Good Food Festival & Conference, please visit the event website by clicking here. Honey Butter Fried Chicken chefs Josh Kulp and Christine Cikowski (with Fox 32 Chicago anchor Darlene Hill) conducted a TV demo on March 2 in support of FamilyFarmed’s March 18 Good Food Festival, where they will receive the organization’s 2017 Good Food Chef of the Year Award. 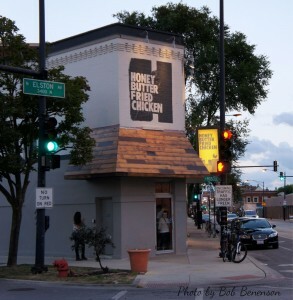 On Feb. 18 most years, the cozy indoor space at Chicago’s Honey Butter Fried Chicken would be packed with happy diners escaping the cold. 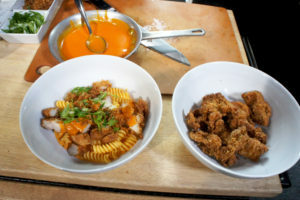 The Honey Butter Fried Chicken chefs prepared their pimento fried chicken macaroni and cheese during their Fox 32 Chicago TV demo on March 2. But when Good Food on Every Table visited chef-owners Christine Cikowski and Josh Kulp this Feb. 18 — to discuss the Good Food Chef of the Year Award they will receive at FamilyFarmed’s Good Food Festival March 18 — Chicago experienced a rare taste of spring, with temperatures in the 60s. A shirt-sleeve crowd was enjoying their delicious, locally and sustainably produced food on Honey Butter’s outdoor patio. Sometimes you just get lucky. But the now-lengthy run of success for one of Chicago’s favorite fast-casual places is not the result of luck, but rather the skills Cikowski and Kulp learned when they became friends at Chicago’s Kendall College culinary school and the deep social consciousness they bring to their work. Since they expanded beyond the Sunday Dinner Club pop-up events that first made their names on Chicago’s food scene, Cikowski and Kulp have managed Honey Butter Fried Chicken with industry-leading worker-friendly policies. Their wages and benefits are well above average among restaurants. 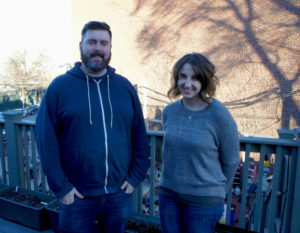 Chefs Josh Kulp and Christine Cikowski are business partners at Honey Butter Fried Chicken and Sunday Dinner Club. They are standing on the deck (overlooking the dining patio) in their building that houses both restaurants. And their belief that workers and customers need to feel welcome regardless of their race, ethnicity, sexual orientation and immigration status led Honey Butter to become the first of now-several places in Chicago designated as a “Sanctuary Restaurant” under a program run by the nonprofit Restaurant Opportunities Center (ROC) United. We’ll get back to what makes Honey Butter Fried Chicken’s food special, because let’s face it — no matter how good your heart is, 80 people are not going to spend a Saturday afternoon on your patio in February, even when the weather is unseasonably warm, if the food isn’t great. 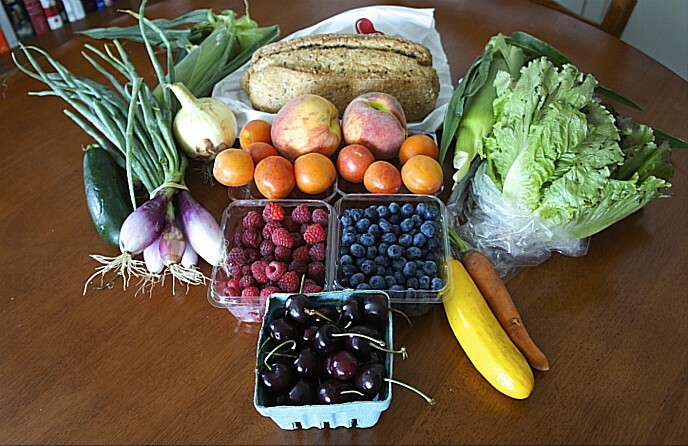 But the truth is that there are many restaurants with great food in the Chicago area, but those selected for FamilyFarmed’s Good Food Chef of the Year go the extra miles to help build a better, healthier, more sustainable and more economically balanced food system. The three previous winners — Rick Bayless of the Frontera restaurant group, Paul Fehribach of Big Jones restaurant, and Paul Kahan of the One Off Hospitality Group — all combine great food with local and sustainable sourcing and responsible treatment of their workers. So let’s hear first from Christine and Josh about the social mission that drives their work. 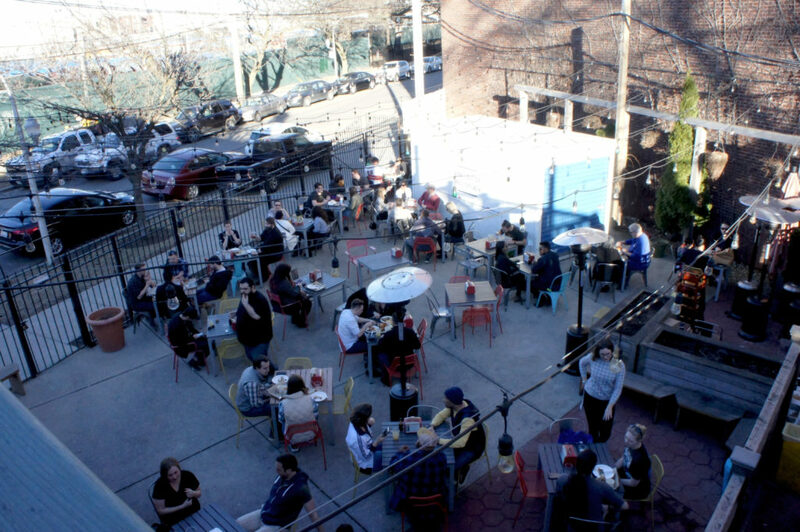 Thanks to an unusual warm spell, the patio at Honey Butter Fried Chicken in Chicago’s Avondale neighborhood was as full on Feb. 18 as it will be this spring and summer. “Josh and I decided that if we were going to own businesses, we were going to not do it without treating our employees fairly and without giving them a nurturing work environment. That was sort of our vision for it. It’s evolved over the years,” said Cikowski. It is hardly standard for restaurants to pay above-minimum wages to all employees or to provide benefits — such as paid time off, sick leave and parental leave — more associated with corporate offices. The owners even got ahead of the curve by eliminating tipping and adjusting employees’ wages to compensate. And Honey Butter’s inclusive worker policies extend to an “open book management” policy in which the restaurant’s revenues and expenses are discussed weekly at staff meetings. Cikowski and Kulp are devotees of the practice widely associated with Zingerman’s, the famed deli/restaurant group in Ann Arbor, Michigan, and its ZingTrain program for restaurant executives. For Cikowski and Kulp, these practices are not only right to do. They are at the heart of Honey Butter Fried Chicken’s success. Their social values also prompted the Honey Butter chefs to become early adopters of the Sanctuary Restaurant concept. “We need to loudly proclaim that in this place, when you walk in, if you’re transgendered, if you’re Muslim, if you’re Mexican, you’re going to be welcome and treated with respect,” Kulp said. Both chefs already were actively involved with the efforts to promote better treatment of workers advocated by the Restaurant Opportunities Center and its affiliate RAISE (Restaurants Advancing Industry Standards in Employment). Early this year, ROC created the Sanctuary Restaurant concept in response to a volatile political atmosphere it views as threatening to immigrants — who make up a vast proportion of the workforce both in the restaurant industry and on the farms that produce their food. “There’s a call to action to say restaurants are safe places where the community comes together, and they should be discrimination-free zones where everybody feels safe and welcome. They came up with this term ‘Sanctuary Restaurants’ to be a safe place for everybody, a place at the table for everyone,” Cikowski said. But again, if people didn’t love their food, Cikowski and Kulp would get a pat on their backs for their social conscience instead of the full houses and lines to the door they have enjoyed since they opened in September 2013. 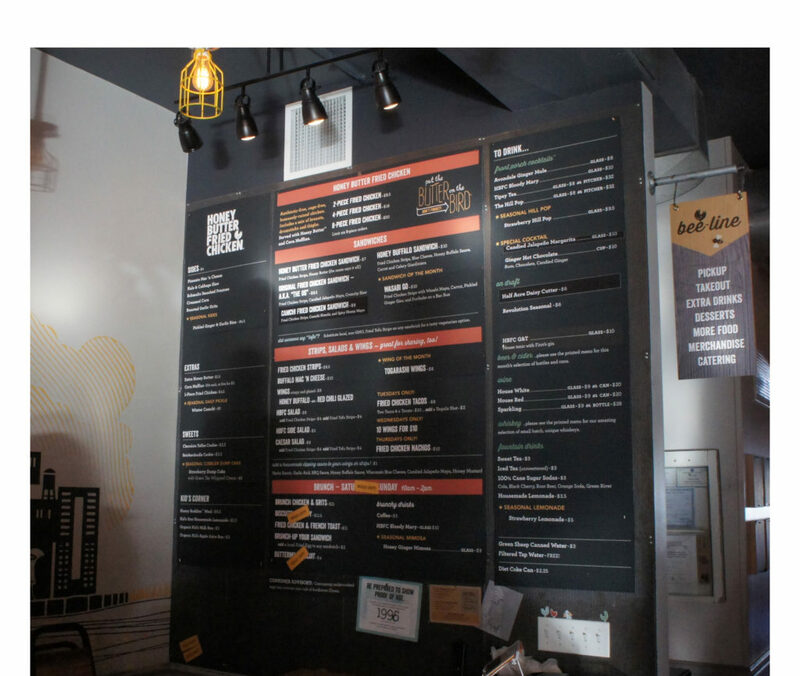 The food menu behind the ordering counter at Honey Butter Fried Chicken. Along with the honey butter, their fried chicken has other uncommon characteristics. For instance, except for the drumsticks, their chicken is fried boneless. It also is prepared with a substantial sprinkling of smoked paprika. Yet despite the popularity of the chicken among the smaller Sunday Dinner Club clientele, Kulp said he and Cikowski planned for 100 to 150 customers on a weekend, which would have required 35 to 40 chickens. Instead, they dealt with the good problem of instant success, drawing upwards of 1,000 customers on weekends and having to up their orders to Miller Poultry — a sustainable producer in northern Indiana — to 300 or more chickens. The restaurant’s core menu of fried chicken platters and sandwiches has not changed dramatically since 2013, but the owners constantly apply their chef skills to new wrinkles. For instance, one of their sandwiches comes topped with their own version of spicy kimchi, developed by chef de cuisine Cam Waron and called Camchi. On special during the week of our visit was their take on Japanese ramen, a singular (and irresistible) combination of noodles, pimento cheese broth, fried chicken and candied jalapeno peppers. 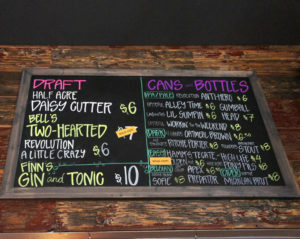 Honey Butter Fried Chicken’s beverage menu — made up of beers and spirits produced in the Chicago region — reflects its owners’ devotion to local sourcing. The restaurant also accommodates non-carnivore customers with fried tofu versions of their dishes. They get their tofu from Chicago’s Phoenix Bean, which is a major success story in its own right. Demand for the sustainably produced and uniquely flavorful tofu prompted owner Jenny Yang — a Fellow in the first cohort of FamilyFarmed’s Good Food Business Accelerator — to secure a $1.5 million SBA-backed loan to expand her production facilities five-fold. Cikowski and Kulp admit that most people would not define fried chicken as “health food,” but they believe their Good Food principles more than justify the treat. “If somebody is interested in having the hedonistic fast food experience, but you don’t eat that because it just feels like junk to you, you come here,” Kulp said. This entry was posted in Uncategorized and tagged Big Jones restaurant, chef activism, chef advocacy, Chicago restaurants, FamilyFarmed, fast casual restaurants, Fried chicken, Frontera restaurant group, Good Food Business Accelerator, Good Food Chef of the Year Award, Good Food fast casual restaurants, Good Food Festival, Good Food Festival & Conference, Honey Butter Fried Chicken, Kendall College, Miller Poultry, One Off Hospitality Group, Paul Fehribach, Paul Kahan, Phoenix Bean tofu, RAISE, restaurant open book management, Restaurant Opportunities Center, restaurant worker pay and benefits, Rick Bayless, ROC United, Sanctuary Restaurants, Sunday Dinner Club, Zingerman's, ZingTrain. Bookmark the permalink.